Drumroll, please! 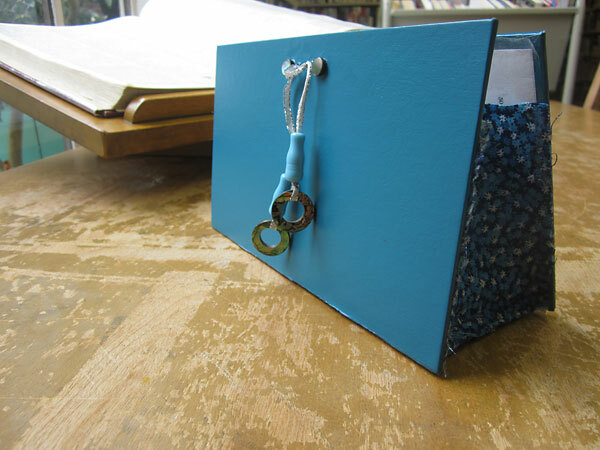 We’re ready to announce the winners in our UNBOUND Book Art & Craft Contest! 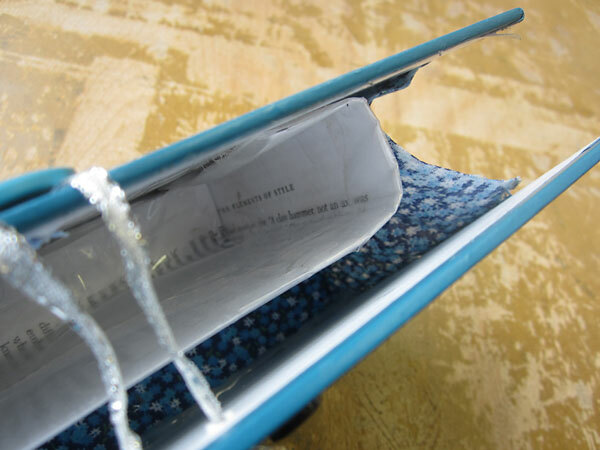 We received some amazing entries, and each of them used a book in unique and interesting ways. 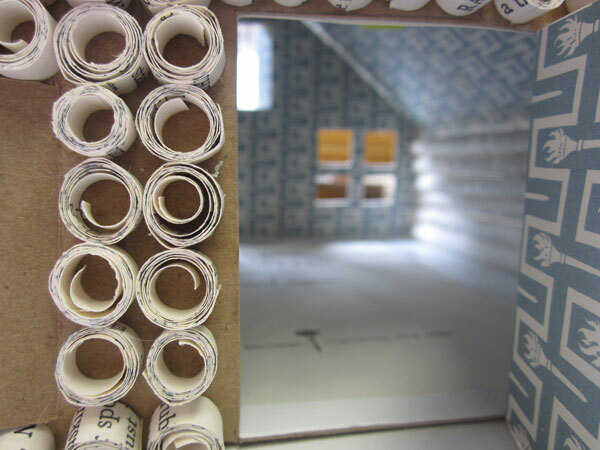 Click on any of the photos below to see bigger versions, or see our Pinterest board. Congratulations to everyone! And special thanks to City Councilmember Libby Schaaf for being our celebrity judge! 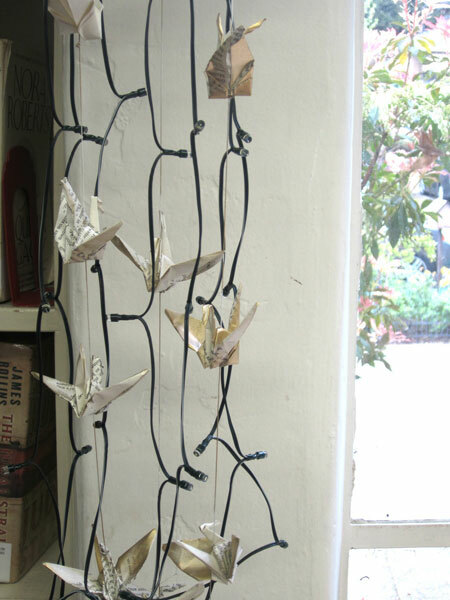 In the Teen division, Mollie S. took top honors with her mobile titled “The Flight of Words,” featuring gilded paper cranes folded from book pages, hanging from the book body along with solar-powered string lights. 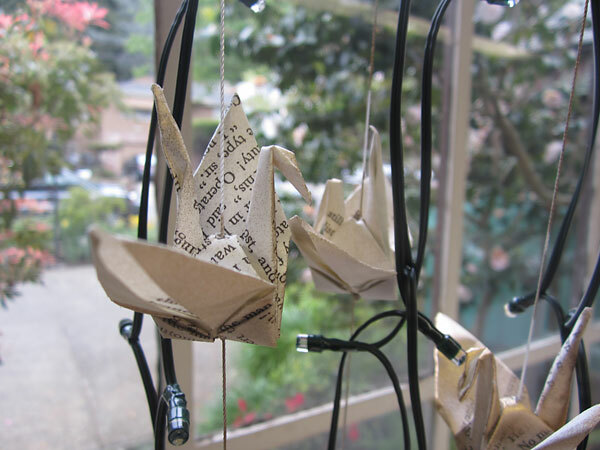 Our judges liked the lights and the fact that the cranes are peace symbols folded from a book about war (“The Guns of Navarone”). 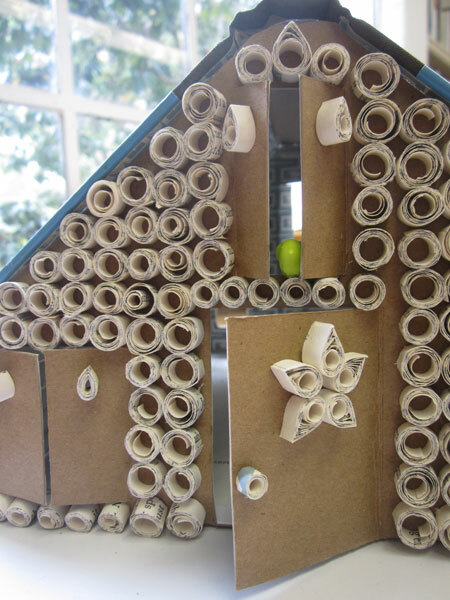 In the Adult division, first place went to Kamni Vijay, who built her piece, “Log Cabin,” using quilled book pages to represent logs and the book’s cover as the roof. 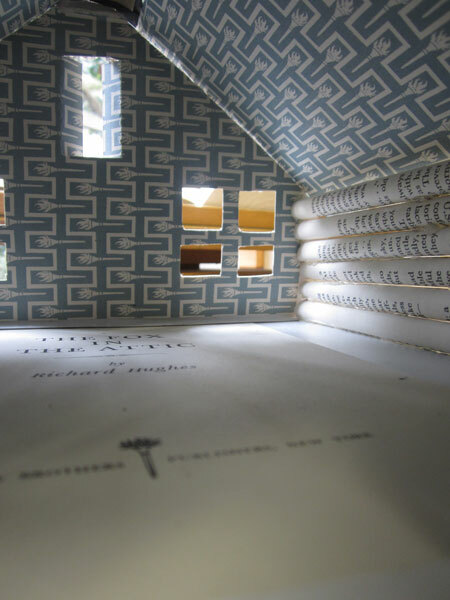 Inside, the the walls are papered with the book’s endpapers and the floor is the title page. 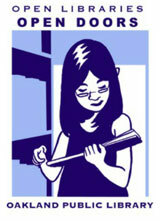 Our judges loved that she used almost every part of the book, and the sweet little bird peeking out the front window. It looks like someplace Johanna Spyri’s Heidi would feel at home. 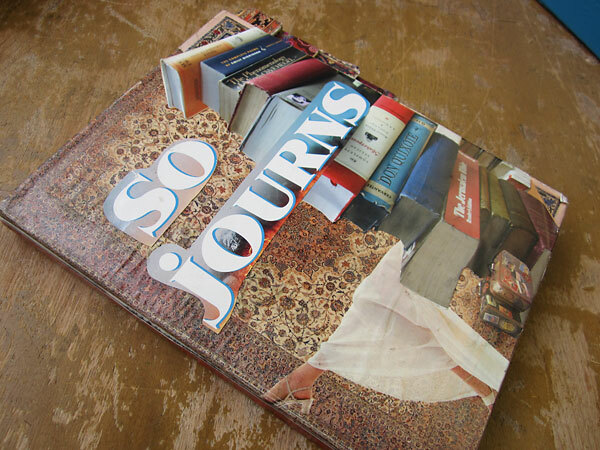 Allyson Rickard‘s piece, “So Journs: Adventures in Books” took second place for adults. 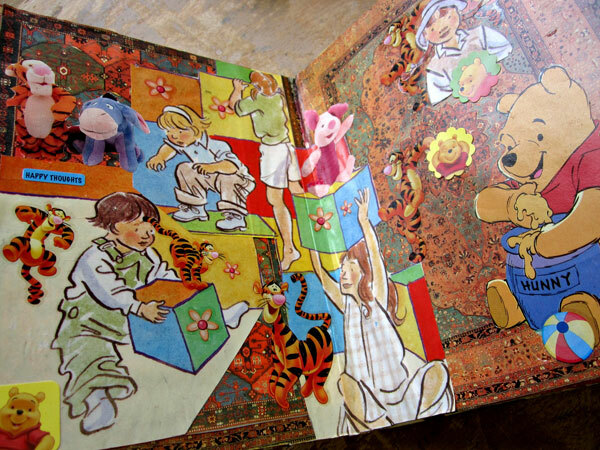 Allyson collaged and altered a children’s board book to represent childhood stories with an adult twist. Judges loved the rich layers of details and images she included. 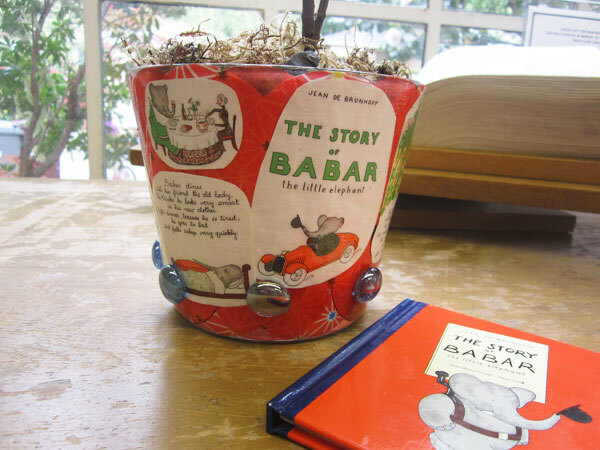 Third place for adults went to Ruth Terashima, who created a Babar-themed Plant Pot decoupaged with Babar images, recycled gift wrap and glass gems. 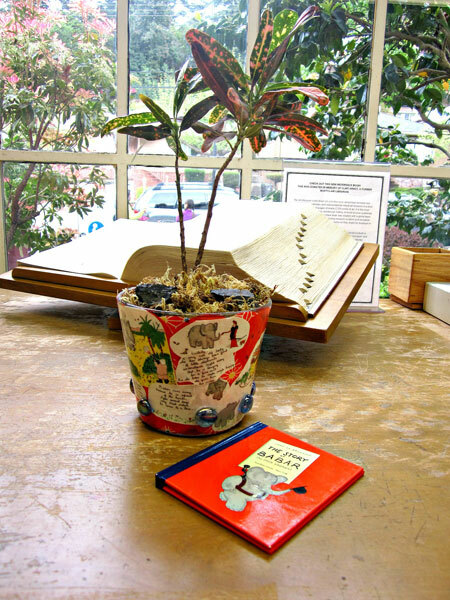 Judges liked that the piece was fun and useful, and even included a live plant.